We have made some great improvements to the behavior feature! 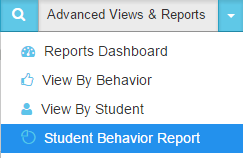 Teachers and parents can now review & print behavior reports, and they can edit & delete recorded behaviors. Teachers can easily email behavior reports to parents with just a few clicks! Get a quick idea of where your class stands with our proficiency graph. Hover over each section to see the number of behaviors recorded. Use the Student Behavior Report to get a more in-depth look at each student’s behavior history. With just a few clicks, send the Student Behavior Report to parents! Now you can easily update and delete existing recorded behaviors.